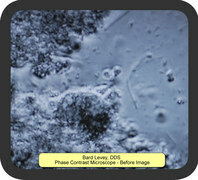 Bard Levey, DDS - Phase Contrast Microscope "Before Image" showing robust microflora symptomatic of periodontitis. (PRLEAP.COM) October 1, 2014 - Dr. Bard Levey, of Croton-on-Hudson, NY, is the most recent recipient of the Orkos Award, a recognition of excellence in case study. 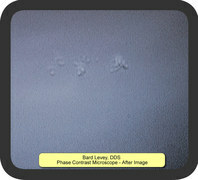 The case submitted by Dr. Levey was especially unique, as he was the prescribing dentist as well as the patient. I'm a second generation dentist who learned that dentists treat patients, not teeth. The patient centric focus has expanded over the years to include a more comprehensive, whole-health understanding of dentistry. This is particularly true for periodontal disease. In 1991, when I graduated from the School of Dentistry in Chapel Hill, dentists knew that untreated periodontal disease led to tooth loss and corresponding restorative needs. Ten years later, the emerging science linking periodontal infections to systemic inflammatory responses changed my perspective. Periodontal disease needs to be treated with greater urgency. The science linking periodontal disease to cardiovascular diseases (CVD) especially captured my attention because I have a strong family history of CVD. Although I am a fit, 49 year old, I take a statin drug to address hereditary high cholesterol. I want to make the healthiest choices possible and I want to offer these choices to my patients. In 2008, I bought my first laser in an attempt to provide more comfortable and more effective care for my perio patients. Laser treatment produces good results and patients appreciate the technology, but, 12-18 months after the treatment, I often notice a deterioration of periodontal health. The hygiene protocol in my office includes regular plaque analysis under a phase contrast microscope. 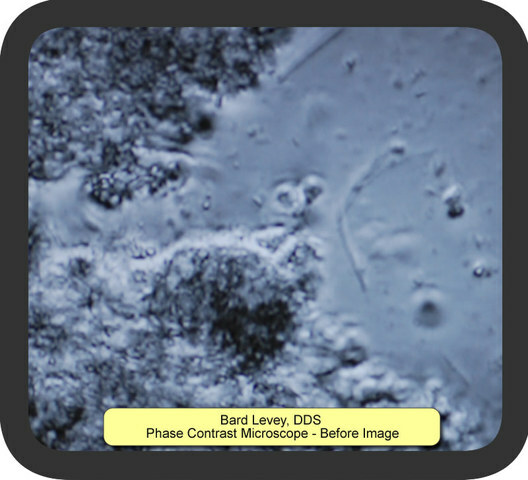 When I looked at samples from patients a year plus after laser therapy, the microscope almost always revealed a robust microflora symptomatic of periodontitis. Antibiotics and localized delivery of antimicrobials did not help. The only localized delivery technique that has helped long-term is Perio Tray delivery of Perio Gel® with 1.7% hydrogen peroxide. When the low concentration of peroxide is held deep in the pocket with the customized Perio Tray, which is specially sealed against the gingiva, the peroxide fights the bacterial infection and oxidizes the biofilm matrix and most exposed biofilm cells. It also oxygenates the pocket's microenvironment. This delivery has made all the difference for my patients. Those using the Perio Trays with peroxide have the clearest plaque samples. The results were so good in the patients with active disease that I decided to use Perio Tray delivery myself for prevention. Although I don't have traditional symptoms of gum disease that are measured in terms of damage, my plaque sample indicated I was at risk and this mattered to me in light of my elevated CVD risks. A month after starting the delivery, which I did two times a day for 10 minutes, my sample was clear. I've checked it regularly ever since. Although many of my patients can maintain healthy conditions with one time a day usage, for me, two times a day works best. For my patients who need better biofilm management, like me, the Perio Tray has been an effective and convenient tool. Generally, response has been very positive. Once you incorporate the tray into your routine, it is as easy to use as a toothbrush. Patient health takes priority, because ultimately we are treating the whole patient. 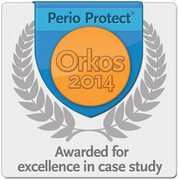 The Orkos Award was founded by Perio Protect, LLC to recognize excellence in case study presentations for periodontal treatment. For additional information about the Orkos Award, go to TheOrkosAward.com/Studies. Visit PerioProtect.com for information about the Perio Protect Method®. 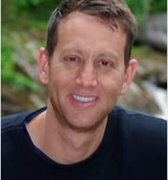 To learn more about Dr. Levey or to contact his office, visit www.youramazingsmile.com or call 914-271-6224.